Delays with the next book. My job has been draining away most of my mental energy, and I’ve been really busy with it lately, so I don’t have a lot left for working on the next book. I have started it though. I’ve written the first scene and most of the second. I’m going to get back to work on it today, and then I’m going to try to divide my time better so I can get back to a daily schedule on it. It’s just going to take some balancing of things on my part, but I’ll figure it all out soon enough. It will appear on other retail sites like Barnes & Noble and Kobo within the week. Synopsis: When you have the literal power of gods, the ultimate accomplishment would be to use that power to create a living world out of a lifeless hunk of rock. This was the idea behind the Genesis project. There’s just one catch. They need to find a lifeless hunk of rock to use for the project before they can set their plans in motion. When a stranger named Gerald shows up in the village however, the source of their god-like powers soon becomes all too clear. Not trusting this amiable stranger in the slightest, Jarrod opens a time portal and travels far into the future. When he returns a few seconds later however, he refuses to tell anyone where he went, or when for that matter. Their concern for him grows even deeper when he starts suffering from debilitating headaches that only seem to get worse as time goes on. Also, during the search for a suitable planet to use for the Genesis project, not one, but two old enemies are discovered and must be dealt with. Sadly, all great things must come to an end. Genesis is the final book of the Unseen Things series, and a fitting send off for the characters we’ve all grown to know and love. Genesis is book 21 of the Unseen Things series. I’ll begin work on my next novel at some point in the next week or so. It’s called Retribution, and it’ll be my first horror/suspense novel. The final book of the Unseen Things series is almost ready to go! I finished editing Genesis and I’m really happy with how it came out. I truly believe it’s a fitting end for the series, and I can’t wait to get it published. The only thing I’m waiting on right now is for my wife to finish reading it, so she can double check it for me and catch any little errors I might have missed when I edited it. She should be done with it at some point this weekend, so as soon as she is I’ll get it published. Tomorrow I’ll start work on my next book, Retribution, which will be a horror / suspense novel. I just finished editing chapter eight of Genesis. I’ve still got eight more chapters to go, but I’m having to mix editing that with editing another book I have to do for work, so it’s going slower than usual. It is progressing though, and I’m really happy with it all. I’ve also created the cover for my next book, and I’ve been thinking about how I want it to play out. It’s definitely going to fall in the horror/suspense genre, but it’s more or less going to be just a one off. I don’t typically write in that genre, so after I get done with it I’m not sure what I’ll be doing. As a writer, one of the most exciting things you can do is to expand your abilities by tackling different genres. So far I’ve done contemporary fantasy, sci-fi, and romantic comedy with just a hint of mystery thrown in. Now I’ll be adding horror to the mix, so I’m really going to have to think about what I want to do after that. Perhaps something more paranormal. I dunno. I guess I’ll just have to see what comes to me down the road. I probably won’t post any more updates until I publish Genesis. Just know that I’m working diligently on it and I’ll get it published just as soon as I can. I’m hoping to be able to have it done by next weekend, but we’ll see how it goes. 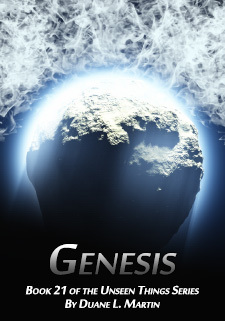 The first draft of Genesis is now complete! I’ve completed the first draft of Genesis, and I plan to start editing it today. Technically this is the final book in the series, but I’m not officially calling it that. I may decide to write more down the road, so I’m basically calling it the final book in the series…at least for now. Whether it’s the final book or not, I’ve written it in such a way that it’s a fitting end to the series. It’s been an amazing run, and I love my characters with all my heart, but there are new stories to tell, and as a writer, you have to know when it’s time to say goodbye to the old and move on to something new. The next few books I write will likely be solo novels, because I definitely want to get more non-series books out there, but who knows? The one I’ll be writing next could warrant more than one book…or it may not. We’ll see what happens. I’m still formulating the ideas for it, and I’ll likely design the cover and get started on it right after I get Genesis published. That’s it for now. Editing is a tedious process and I’m not looking forward to it in the least, but I’m going to get through it just as quickly as I can. There’s a special reason for that, which I’ll share later…if I manage to make the deadline. I’m in the middle of chapter 15 on Genesis now, and things are starting to wind down. It’s a bittersweet thing for me, because for the past three years these characters have been my family, and now it’s all about to come to an end. That being said, I think the storyline I’ve written for Jarrod in this book is not only a fitting end to the series, but it’s some of my best character work to date. I already know how it’s going to end, so right now I’m just filling in the rest to get to that point. I truly believe that anyone who’s read the series will find this to be an emotional and satisfying end to it all. That’s it for now. I’m doing some writing this morning so I can get to some other work I have to do for my job this afternoon. Hopefully I’ll have the book finished by early next week at the latest, and then I can get started the editing process.